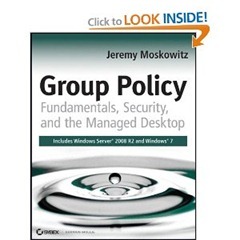 I just got my hands on Jeremy Moskowitz (fellow Group Policy MVP) latest publication called “Group Policy – Fundamentals Security and the Managed Desktop” and as I found it to be a really great book for Group Policy I decided to do a review. This is an updated version of Jeremy previous Group Policy books that has been updated to cover the new Windows 7 and Windows Server 2003 R2 features but of course is still covers the stubbornly popular Windows XP. In read this book it quite apparent that Jeremy bring his experience to this book as it is full of many insightful real world examples and notes. What’s also refreshing about this book (unlike MSPress books) is that its covers solutions using both native tools and third-party tools. The only bad thing I can say about this book is that it over 800 pages so its fairly heavy to keep on your person all the time BUT it also comes in digital format so you download it for your Kindle or for your iPad. Weather you are a novice or expert I thoroughly recommend that you purchase this book for your technical reference library as its a both a great primer beginners and and excellent references for the more advanced policy administrators. If your still not sure you can also click on the image above you can take a look an example chapter. If you are after a copy of the book you you can go to www.gpanswers.com/book and get a personally signed copy you can of course order it from Amazon if you want. Pingback: Group Policy Center » Blog Archive » Come to my (TechEd) Group Policy Session’s!!!! This book post the Fundamentals, Security and the Managed Desktop by Jeremy Moskowitz, I know him he found it to be a really great book for Group Policy. Group policy is one of those topics that I wanted to know more about during college. Unfortunately, our teacher didn’t see it to be as important as android OS. If I should buy this book, which kind of people do you think this book will be more useful to: Network specialists or Software engineers? I think that this book would be a good practical reference for any computer user who is looking to work in a group environment. Yeah right, having a book of 800 pages is quitely heavy to carry but as long as it gives you a lot of information about the Group Policy and how it works, well books weight will doesnt really matter at all. Most speacially it gives you more knowledge on Windows 7 and Server 2008 R2. Reading the latest publication of“Group Policy – Fundamentals Security and the Managed Desktop” just like learning everything from the basics to the most advanced settings. I think it is a good book if the reader would want to learn group policy and how it works. I admire the writing style of the author. He also explain in simple English of Group policy from basic to advanced levels. Two words: Great Book! I have heard positive feedbacks about this book from a friend, and it even made me want to have one for myself! Technology is vast these days; everything’s moving forward one step at a time for new things. This book is certainly a must have I must say for those who wishes to be well guided with more advanced versions of computer operating systems.